Sage (Salvia officinalis) or garden sage is a subshrub, with woody stems, grayish leaves, and blue to purplish flowers. It is a member of the family Lamiaceae (the mint) and is native to the Mediterranean region, though it has naturalized in many places throughout the world. Sage (Salvia officinalis) or garden sage is a subshrub, with woody stems, grayish leaves, and blue to purplish flowers. It is a member of the family Lamiaceae (the mint) and is native to the Mediterranean region though it has naturalized in many places throughout the world. Here are 7 health benefits of sage. 1. Sage can help strengthen weak bones. 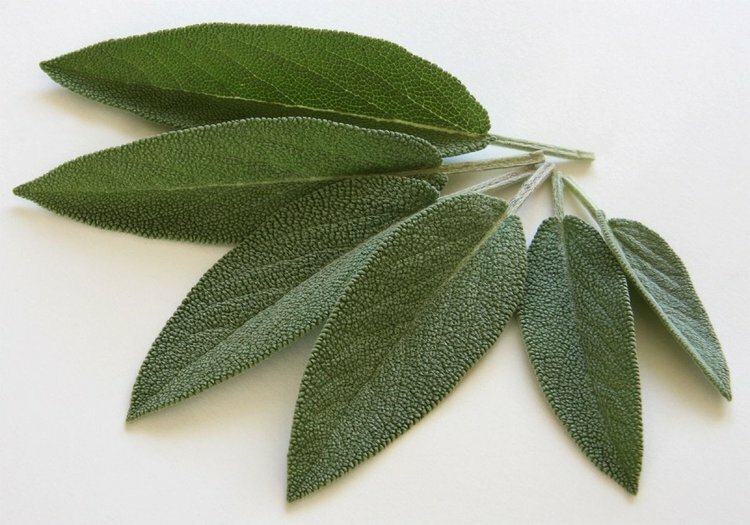 One tablespoon of sage contains 43 percent of vitamin K. Vitamin K improves calcium absorption, reduces urinary excretion of calcium, and acts as a modifier of bone matrix proteins. 2. Sage can help fight or delay Alzheimer’s disease. Vitamin K plays a crucial role in brain and neuronal health. It can prevent the oxidation of brain cells and encourages cognitive activity, helping to delay or even prevent the onset of Alzheimer’s disease. 3. Sage can assist in the antioxidant defense. Sage is an excellent source of the mineral manganese, which is an essential co-factor in some enzymes essential in antioxidant defenses. 4. Sage can help you sleep better at night. Sage contains magnesium, which is a mineral that is directly linked to improving the quality, duration, and tranquility of sleep. Sage also help regulate the metabolism, to help reduce sleep disorders and the occurrence of insomnia. 5. Sage can assist in red blood cell formation. 6. Sage can improve your memory and thinking ability. A study from Northumbria University has suggested that sage essential oil can significantly improve immediate word recall. 7. Sage can work as an anti-inflammatory. Researchers at the University of Vienna, Austria concluded that sage has anti-inflammatory effects on certain bodily ailments. Akhondzadeh, S., Noroozian, M., Mohammadi, M., Ohadinia, S., Jamshidi, A. H., & Khani, M. (2003). Salvia officinalis extract in the treatment of patients with mild to moderate Alzheimer's disease: a double blind, randomized and placebo‐controlled trial. Journal of clinical pharmacy and therapeutics, 28(1), 53-59. Vogl, S., Picker, P., Mihaly-Bison, J., Fakhrudin, N., Atanasov, A. G., Heiss, E. H., ... & Kopp, B. (2013). Ethnopharmacological in vitro studies on Austria's folk medicine—An unexplored lore in vitro anti-inflammatory activities of 71 Austrian traditional herbal drugs. Journal of ethnopharmacology, 149(3), 750-771. Tildesley, N. T., Kennedy, D. O., Perry, E. K., Ballard, C. G., Savelev, S. A. W. K., Wesnes, K. A., & Scholey, A. B. (2003). Salvia lavandulaefolia (Spanish sage) enhances memory in healthy young volunteers. Pharmacology Biochemistry and Behavior, 75(3), 669-674.